With the generous support of a JH Lord Travel Grant I was able to cover part of my travel expenses to the 34th International Geological Congress in Brisbane, Australia. I presented a poster at the conference titled “Subsurface correlation of the Nita and Goldwyer Formations in the southern Broome Platform, Canning Basin”. The poster described the method by using CycloLog software to analyse subsurface wells. The objectives are to determine the depositional environment for the Nita and Goldwyer Formations by correlating the spectral curves of Gamma ray log data (INPEFA_GR curves). 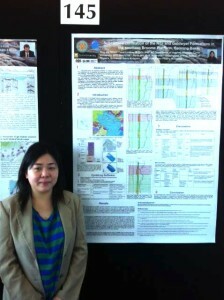 The poster presented the background of the Canning Basin and explained the method, results and discussion. Three wells from southern Broome Platform were used. The comparison between litho-stratigraphy and the depositional environment using this technique provides a methodology for regionally mapping the subsurface cycles at basin scale for the Nita and Goldwyer Formations. During my poster session, the poster was well received and provoked interesting discussions, as well as some excellent feedback. Some of the more relevant talks I attended were the Ordovician intercontinental correlations: developing global and regional chronostratigraphy sessions and some presenters working on the same area with me. Being able to meet with these presenters was a tremendous opportunity to discuss future research in this field.